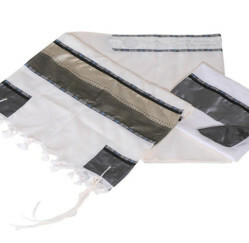 This hand made elegant tallit set is made of wool, with wide brown stripes and thin grey and black decorations. 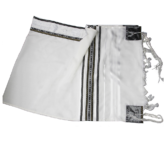 The pure white background and the exquisite chromatic mixture of the stripes provide the Benjamin shawl model with a very original and elegant look. 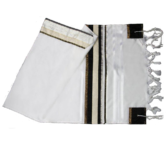 The two main tones of brown (gold and bronze) are bordered in the upper part by a very thin black stripe and in the lower part by a silvery grey one. 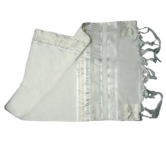 The decorations are simple, but very elegant. 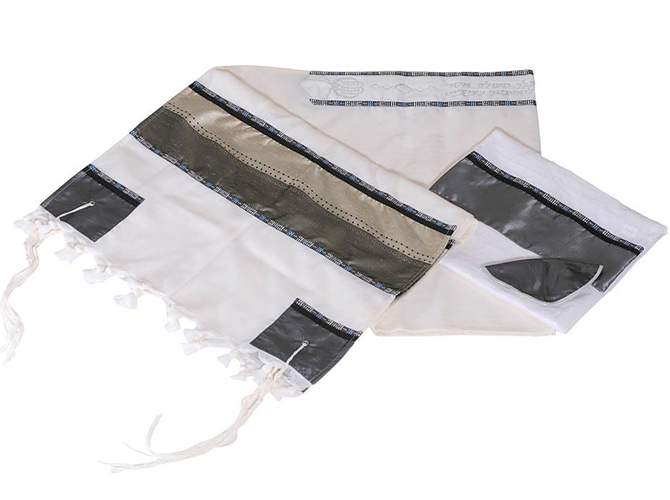 The corner squares are grey and the same color is used for the bag and the kippa. 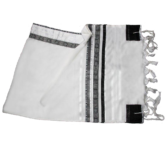 This tallit set is appropriate for festive occasions as well as for the weekly Shabat prayer.